I used to think a story had a beginning, middle, and end. If I have learned nothing else in my decades as an adoptive parent and in my work as an advocate, it’s that a story has multiple beginnings, middles, and endings. It’s rarely a neat package. It’s mostly a work in progress, fluid, subject to change. Adoptive parents often struggle with telling their children about how and why the children needed to be adopted. Their stories are, by their nature, filled with loss, and often with abuse, poverty, violence, and neglect. How these stories are held, honored, and told can be complicated. An additional enormous complication is whether the stories are accurate. Another is whether the stories are available to the adopted person, who may search for the people and details that made up his or her life before adoption. What was thought to be The Story can turn out to be something extremely different. 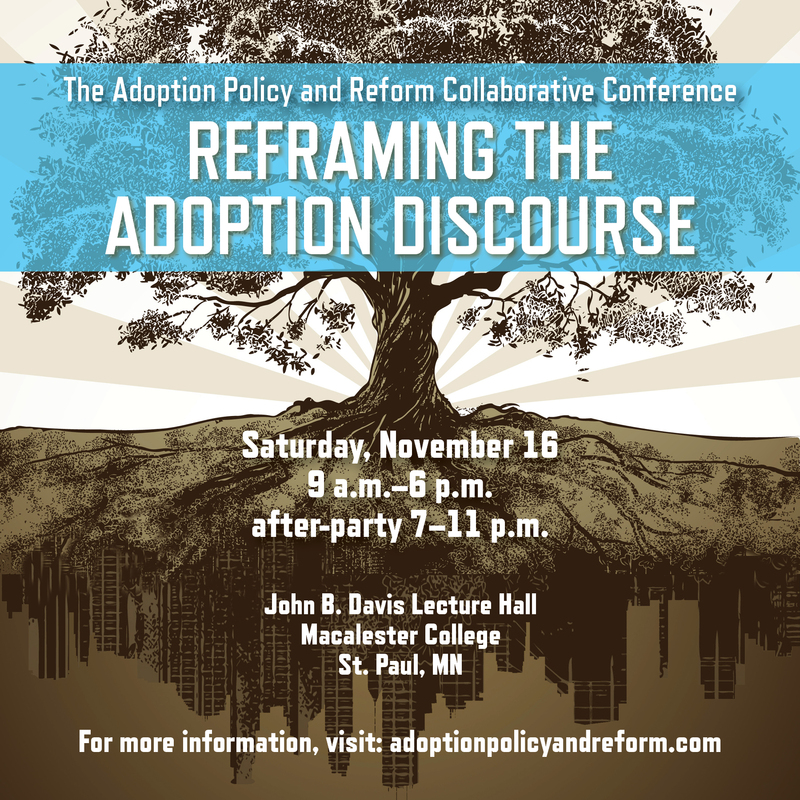 On November 16, I attended the amazing, adoptee-led, adoptee-centric “Reframing the Adoption Discourse” conference sponsored by the Adoption Policy and Reform Collaborative and AdopSource. Held in Minnesota, also known as the Land of Gazillion Adoptees, it was a day filled with panels, ideas, and insights. All the panels (Research, Policy, Mental Health, Performance, Advocacy) were wonderful, and I’ll write about each of them over the next weeks. Today, I’m going to start with the Performance Panel. I’m starting with this panel because they spoke most about stories: not only their own, but also about the nature of stories and storytelling. Katie, Kurt, and Marissa were adopted to the US from Korea. Chad was born in the US, and is African-American. All are transracial adoptees. All are now adults, who have chosen to tell some of their stories through poetry, plays, spoken word, and dance. I’ve written about Katie before, having seen her powerful one-woman show, N/A. Katie is an adult. She still doesn’t have the full story of her origins, something most of us take for granted. This lack of information has been particularly complex for Katie around medical issues. Katie, like Chad, Kurt, and Marissa, has used art as a way to tell and understand her adoption story, even in its incompleteness. We aren’t talking about Choco, or Horace, or foxes, bears, or the moon anymore. These are the genuine stories of adoptees, who are now adults, still working on understanding and processing the realities of how they started out in one family and were moved to another. In some cases, the doors seemed to have shut firmly on the first family, though the search for truth remains. For these four, art has been a form of activism around their adoption stories, and around adoption generally. Katie talked about how meeting other Asian-Americans in theater work helped her to better understand herself, and created a community of creativity. Kurt participated in group sports in high school, and said that helped him handle group identity. It was dance, though, that genuinely allowed him to see his body as an individual, to further gain a genuine sense of self. The power of the arts, said Kurt, is that we remember, we create stories, and we create a platform then for talking about stories. Chad said that, as a black child in a white family, he’d “been performing all along,” and that, for him, “things make sense on stage.” Performance and the arts create an “empowerment narrative,” a storytelling that can be liberating from the harsh realities of racism and isolation, though those are a core part of the story. Marissa spoke about the power of stories to educate, and how telling stories can evolve into activism. When she is in the United States, she said, she is Korean American. When she is in Korea, she is American Korean. That difference informs her art, informs her story, informs her sense of self. Brilliant, powerful, challenging. So important to be open to deep listening, even of painful truths. And as Kurt said, “I hope we all dance soon.” Dancing through pain, dancing through closed doors, dancing through joy and healing. “Chuffed” is British slang for being pleased, mixed with a bit of proud. CHIFF is the Children in Families First Act. I’ve written here about Why CHIFF Will (and Should) Fail, and here about What CHIFF Lacks, And Why It Must Be Abandoned. I am not chuffed about CHIFF. Those two posts above explain why. Not surprisingly, I’ve gotten some pushback from folks at adoption agencies about my views. Why am I opposed to helping children who need families? I’m not, it turns out. I believe adoption is a potential, positive option for children in genuine need of families. I agree that children are better off growing up in safe, loving families rather than in institutions. As is often the case, however, this is far more complicated than a warm and fuzzy scenario of homes for orphans. CHIFF is about a new bureaucracy, plus misplaced funding that ignores existing needs, and a blatant failure to include those most affected. Many years ago, when I was working for the Joint Council on International Children’s Services (I was there from 1995-2000), we worked on several pieces of significant adoption-related legislation. One was the Hague Convention on Intercountry Adoption. Two others were part of the immigration bill in 1996, one requiring immunizations prior to immigration to the US, and the other mandating deportation of non-US citizens who were convicted of a felony. The immunizations issue was settled fairly easily, with prospective adoptive parents having to sign a form saying they would get their children immunized here (or get an exemption for religious reasons, for example). The deportation issue, though, was far more complex. Adult international adoptees who had not acquired US citizenship and committed a felony were deported, regardless of having been brought here by US citizens for adoption, having been raised here their whole lives, and having no connection (language, family, school, religion, etc.) with their country of origin. This absurdity was part of the impetus behind the Child Citizenship Act of 2000, which gave (relatively) automatic citizenship to internationally adopted children. More information is available here, in my posts All They Will Call You Will Be Deportees and Citizenship Isn’t Automatic for Internationally Adopted Children to the US?. All those legislative issues were complicated, and we are still feeling the implications certainly of the Hague Convention and of the deportation/citizenship law. When I think back of my involvement with both, I am aware of two glaring omissions from the discussions and implementation of both: very few adult adoptees or first parents were involved. By far, it was international lawyers, adoption agencies’ staff, and adoptive parents who were the forces behind the legislative process: the same (mostly white, well-educated, politically savvy, well-off) demographic of those who are supporting CHIFF. Had adoptees and first parents genuinely and fully been invited to share their experiences around adoption, perhaps the Hague Convention would have been more smoothly implemented here in the US. Perhaps the Council On Accreditation would have more effective criteria for the accreditation of adoption agencies under the Hague. Perhaps consultation and input from adopted adults would have been more convincing about the need for appropriate and fair citizenship legislation. I include myself in falling short on insisting that adoptees and first parents have a place at the table during those legislative processes. That’s why I am speaking out as loudly as possible now. As I look at the supporters of CHIFF, I see a list comprised almost entirely of adoption agencies. Adoption agencies are not focused on family preservation–let’s be clear about that. Theirs is a different mission and focus. Family preservation is expensive, complicated, and labor-intensive. Adoption work can similarly described, though it requires different staffing, skills, evaluation, and funding than family preservation. It’s also easy to see how conflicts of interest could occur, if an agency pursues both. CHIFF also has the support of dozens of individual adoption agencies. Why is that, if CHIFF emphasizes family preservation? About the pushback I’ve received: I heard from one of the above agencies, saying I’d rattled a few cages. Good. Because here’s the deal: Adoptee groups are more common, more vocal, and more effective than when I was at JCICS and other organizations. I’m not excusing my failure to include them at the time. I am saying, though, that there are plenty of organized groups now across the adoptee spectrum. There are amazing, thoughtful adoptees who are Ph.D’s and MSW’s and LCSW’s who could offer great insights into this legislation, but I don’t see their names or their affiliations on the list of CHIFF supporters. That speaks volumes to me, that the CHIFF Working Group Executive Committee and its list of supporters are predominantly adoption agencies and adoptive parents. Interestingly, the “Likes” on the Facebook page of the Children in Families First group is 2439. The “Likes” on the “Stop CHIFF” Facebook page is 2507. A few years ago, before the empowerment that is social media, the balance would not have been so close. It’s all changing now. Here’s another important reality that currently is often ignored. There are plenty of adult adoptees who love their adoptive parents, who are grateful to have been adopted, who recognize that their lives would have been totally different (certainly economically and perhaps otherwise) had they not been adopted. These are among the most powerful adopted adults who are speaking out, demanding change in the international adoption process, These adult adoptees love their adoptive families and they had happy childhoods. They are also speaking out about adoption, seeking change in the international adoption process, demanding transparency and integrity, and insisting on a role for themselves and for first/birth parents in the future of international adoption. As to the notion that some of the adoptee groups don’t play well with others, and so are not invited to this sandbox: Enough. There are many, many adult adoptee groups and adoptee professionals working in adoption. If the adoption agency groups have insights and inroads to the politicians–and it surely looks as though they do–why don’t they share their skills and experience with adoptee groups? Is anyone else struck by the fact that some adoption agencies and adoption-related organizations don’t want to hear from, talk with, or work with some adopted adults who are now speaking out? These adoptees were brought to the US by these agencies and organizations. Have the agencies no ethical responsibility to find common ground? Even (or especially) with adopted adults who’ve struggled mightily with loss and grief, who had horrific childhoods, or who view their adoption as a painful life event? Is anyone else struck by the fact that the international adoption agencies and adoption-related organizations are not reaching out to first parents to provide post-adoption services to them, the way the services are provided (or at least offered) to US adoptive parents? Where is the integrity in that? For that matter, I’d love to see an evaluation of the pre-placement services provided to international first parents. Do the services match what is available to US birth/first parents? If not, why not? Is anyone else struck by the fact that CHIFF is “about reallocating a small portion of the $2 billion the US Government already spends on assistance programs for children internationally” but doesn’t say how much that “small portion” is? The US government currently provides billions in the adoption tax credit, a fragment for the adoption of foster care children but primarily allocated to international and private adoptions. Your tax dollars are already hard at work reimbursing relatively well-off adoptive parents for travel and hotels overseas. We are talking huge amounts of money here, that could be spent far more responsibly. Is anyone else struck by the fact that adoptive parents of internationally adopted children are often able, after placement, to quickly find out the true backgrounds of their children, backgrounds that are all too often not what the agency told them? Should we ignore the fact that increasing numbers adult adoptees travel back to their country of origin and find their truth is very different from what the agency told them, their first parents, and their adoptive parents? Is anyone else heartbroken about the fact that internationally adopted children are “re-homed” in an underground Internet system, that internationally adopted children are showing up in increasing numbers in the US foster care system, and that some internationally adopted children adopted as teens to the US are thrown out of their families when they reach 18? I am well aware that adoptive parents and adoption-related organizations hold the most power in adoption policy–for now. I am aware that some (though not all) adoptee groups are adversarial, even hostile. 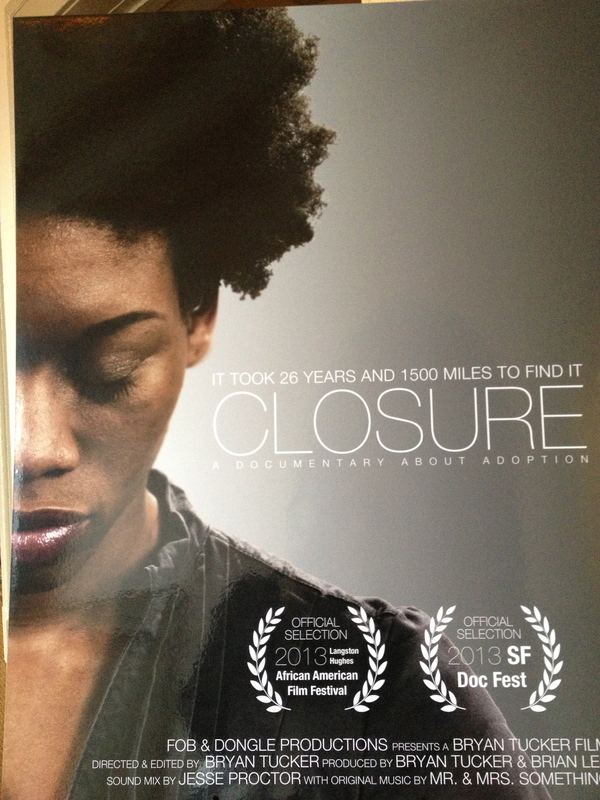 But let’s not dismiss the realities experienced by so-called difficult adoptees. (Arguably, we do that all too often as shown by the dearth of appropriate post-adoption services for adopted children and teens. There could be a correlation.) Let’s not hope that they just go away, now that they’ve grown up. Collaboration, not further marginalization, is the only way to move toward well-grounded adoption policy and reform. Let’s invite adult adoptees and first families to the table, and stop repeating the same mistakes. Let’s not pour more money and time into international adoption policy that does not adequately meet the needs of current adoptees, prospective adoptees, and constantly-marginalized first families. CHIFF is new US legislation related to international adoption. Its full name is Children in Families First. You can read about it on their website. The ostensible goal is something most humans can agree on: children should grow up in loving, safe families. CHIFF, however, would like to change “US policies and investments” to do this. That’s where things begin to fall apart. Why will and should CHIFF fail? Because it is essentially the product of a union between the US Congress and adoption agencies, with some adoptive parents mixed in as well. Who’s not on either of these lists? 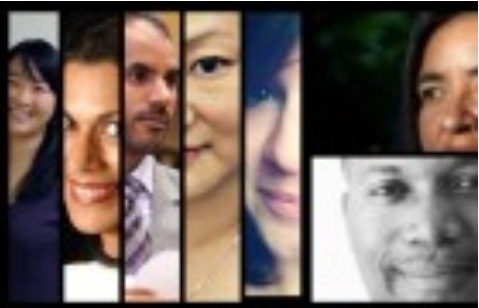 Advocates who give voice to International Adoptees and First Parents. Here’s a sampling. Whether any of these groups (and many others like them) were consulted in the formulation of CHIFF, I do not know. I doubt it, since none is listed as a supporter. The above list runs something of a gamut in terms of advocacy and attitudes towards adoption. I acknowledge that an extraordinarily talented facilitator would be needed to guide a discussion among them and the supporters of CHIFF. Here’s the point: CHIFF is lauded by the US House and Senate sponsors, along with some big names in adoption agency work, as an important, significant piece of adoption reform legislation. There may be some good policy ideas in it. But adoption agencies (and adoption attorneys) have a substantial economic stake in this, though some may also have a moral and ethical stake. The fact that there was no consultation nor buy-in from significant international adoptee or first parent groups, and that there is no public support from these groups, is revealing. And that is why this legislation should fail. Until our US government takes seriously the range of views of international adult adoptees and until it engages those adoptees and international first families in a transparent and public way, there can be no genuinely meaningful international adoption policy. The membership of The Adoption Policy and Reform Collaborative is, in their words, a diverse group of adoptee professionals, clinicians, researchers, educators, artists, and activists from across the United States. The mission is to identify, create, implement, and sustain ethical adoption practices through collaboration with other stakeholders. In response to the Reuters’ series on “re-homing” adopted children, the APRC has issued a statement, available here. The APRC is a group of adult adoptees (US, international, transracial, foster care) who have joined together to promote adoption reform. They spoke out about the issue over a year ago with staff from the Congressional Coalition on Adoption Institute and others. Many adopted children have been adopted and turned away from their adoptive parents’ homes before turning 18 or often shortly after. Youth shelters often have high cases of adopted teens/youth. Reasons for displacements, disruptions, and dissolutions: lack of appropriate adoptive parent training and preparation, limited or no information about child’s history , absence of or minimal quality post-adoption support, marginal insurance coverage for major mental health services. Much valuable food for thought here. 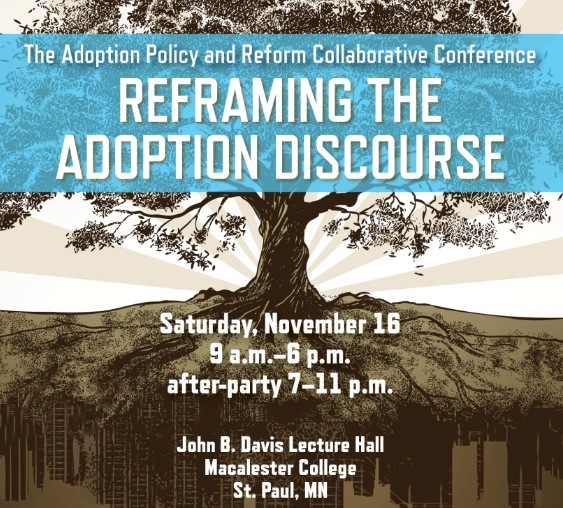 The APRC, by the way, is sponsoring the November conference “Reframing the Adoption Discourse,” a ground-breaking, adoptee-led event. I wrote about it here, encouraging early registration, for the conference and for the Minnesota Transracial Film Festival. There is still time, but both are filling up quickly. You can register here.